What is it about fizz that turns a drink from boring to brilliant? Having sparkling water on tap is perfect when you want something exciting and refreshing but without any calories or alcohol. And for those who find drinking water during the day a chore, it’s now like a reward! Having said all that, you’re probably not going to go to the lengths of making sparkling water this way unless you’re already a homebrewer who kegs. Making the water costs pennies. It’s about 1.5 cents per 12oz glass (plus the cost of any flavored ingredients you add) compared to dollars per bottle commercially, but the equipment is probably not worth the investment unless you want to start putting beer on tap too! The soda industry used to use these kegs (called “cornelius kegs” after one of the manufacturers) to deliver soda to restaurants. Nowadays, they deliver a box of syrup that gets mixed in-line with carbonated water in the system. Lucky for us homebrewers, that opened a world of used kegs to us that are perfect sized for homebrew batches. Each keg holds five gallons. First I clean them thoroughly, taking all the hardware apart and soaking in a cleaner similar to oxyclean. Then I sanitize with a homebrew sanitizer. This thoroughness is honestly probably not necessary for sparkling water, but I do it because these kegs will also be used to hold beer at some point, and contamination from unwanted microorganisms can quickly ruin a batch of beer. I then fill it almost to the brim with ice water. To chill five gallons of water you’ll probably need about 5-10 pounds of ice. Alternatively, you can just fill the keg and let it sit in a fridge for ~24 hours. 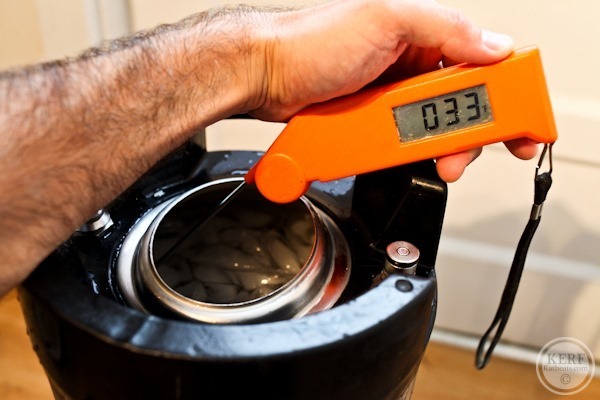 Leave about a quart or two of headspace inside the keg – it will make carbonating easier. It will also carbonate easier if you get it as close to 32 degrees as possible. Another classic option is to strain the juice from a bunch of citrus fruits. Try a lime, lemon, and two oranges together. Or you can soak fresh mint in green tea at room temperature for 24 hours and then dose your water as desired. The sky’s the limit! 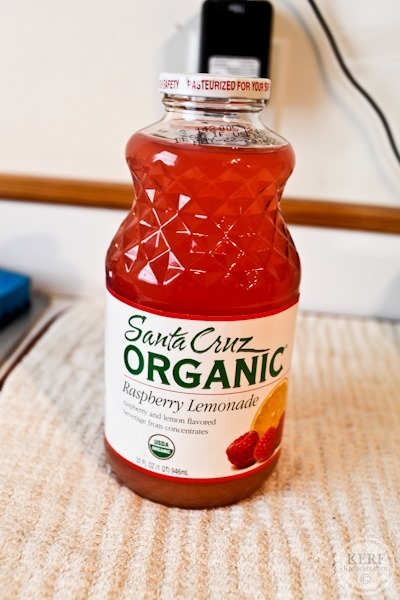 I started with 1.5 cups of this lemonade but sometimes all it takes is a quarter cup of something very strong. I ended up adding another half cup later on for a boost in flavor. 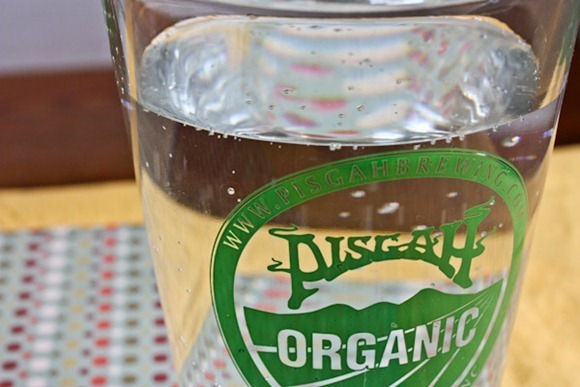 Now that you have cold, flavored water it’s time to carbonate. 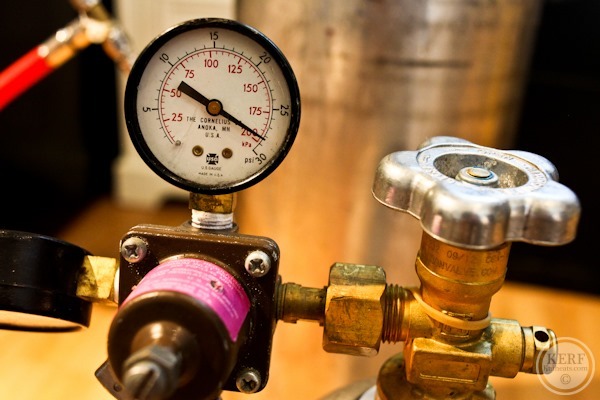 You’ll need a CO2 tank and regulator, plus the appropriate fittings to connect to the keg. 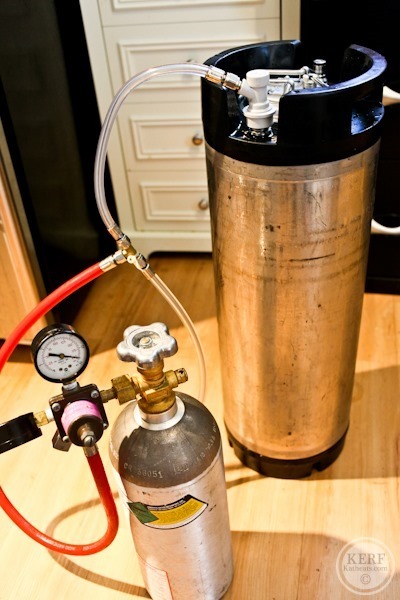 Many homebrewing websites sell a starter kegging kit that includes the tank, regulator, fittings, and one keg, and they usually run about $180-200. Once hooked up, I turn the PSI up to almost 30. No seriously! We’re taking advantage of the fact that gas will dissolve into a solution when under pressure. Shaking the keg just moves the water around and exposes the surface area to the CO2 that is being pushed into the keg. This is why you want to leave a quart or two of open space inside the keg – that’s a lot of surface area that can be moved around. Turning it on its side makes it easier to move around. It takes about five minutes. I’ll gladly look stupid for five minutes to have sparkling water on tap! Check it every couple of minutes to know when you’re getting close. Unlike beer, water doesn’t create any foam to explode out of the tap so it’s easy to check. Once it’s fully carbonated, I reduce to a serving pressure of about 12 PSI. This is the same pressure at which I serve my beers. Some homebrewers will get super fancy and have extra equipment to maintain the high pressure but I find that a normal amount of carbonation is plenty refreshing and tasty. Check out this chart for pressure/temperature recommendations for serving. I usually aim for around 2.2 volumes of CO2. When ready I plop it into the kegerator! That’s a whole ‘nother build itself, but I pretty much followed these instructions to the letter. Go forth and live your life refreshed! I just love your guest posts, Matt! You have a great sense of humor, and I think you and Kath compliment one another perfectly. I wish I had the equipment and patience to do this myself, but unfortunately, I’ll still be buying mine for the ole store. But this post was very informative. Thanks! This is so cool! I wish I could do this at home too! It would save so much money!! I’ve always wanted to know how to make sparkling water. Thank you. Your husband is a champ for shaking the Keg. I’ll either need to work at my muscles or have a man help me out! You are so creative. Hahahahahaha I can’t stop watching that vine ahahaha!! You and Matt amaze me with your home “inventions”. You guys have so much fun! Yeah, a sodastream is much easier and more accessible to most people. I exchange my canisters at Bed, Bath, and Beyond when I have 20% off coupons, too. Definitely agree those are more accessible. I’ve never looked into them, though – what does it end up costing you for X amount? It’s really, really cheap. The refill bottles of C02 cost about $20, and they lasted us about 6 months at a time. We would go through maybe 4-8 liters a week of water. So you’re looking at an initial cost of about $100, then maybe $40-50 a year for sparkling water, so it costs about the same as what you have outlined above. It’s also way more accessible and easier than kegging carbonated water, unless you already brew beer and have the space and equipment. I’ve recently found that at least some Staples locations (maybe all, I don’t go to many) carry Soda Streams, funny enough, and they’re another good store at giving coupons. The exchanges are $15, but we’re usually getting them for about $12, I think. Hope that can be helpful to other Soda Stream users if you (like me) don’t have a BB&B handy. I never go get a C02 replacement canister unless I have a coupon! Thanks Chelsea because I’ll watch for staples coupons too, now! Wow! Yeah, I won’t be trying that while I live at home with my parents. But maybe some day!! I love that you have a Kegerator. That’s awesome. Very interesting concept! It looks very refreshing and of course, I am all for carbonated beverages! I’ve recently been adding rose water to my hot teas and ice waters. So delicious. Kath, have you tried rose water before? hopefully you can find it where you live. You only need a small bit maybe 1T or less for a glass. By the way, Barney Butter has new flavors! Honey flax and more. Have you tried them? Wow, that really does look like a lot of fun. Matt you are very brave to be on camera, and I would guess very strong to be able to shake that big thing. This seems very similar to the soda stream only a lot bigger and I am sure a lot better. So I have a question: Does the plan carbonated water end up tasting like seltzer water? I really don’t care for seltzer water just plain, however I do like the flavored waters you buy at the store. This makes drinking water a lot more fun, and you can customize it to your liking. I have been in love with drinking water with lemons, but the lemonade just sounds more interesting. Even when you make it plain it’s pretty tasty. I’d compare this more to sparkling water you can buy like Poland Springs brand. It doesn’t have that minerally taste like some club sodas out there. Frankly I don’t really know. There are many ways to produce CO2… or really we should say “harvest” it because many of them involve catching the CO2 produced by organisms during fermentation. No idea about the environmental impact. One thing I’m curious about is the consumption of carbonated beverages. CO2 when dissolved in solution creates carbonic acid. I don’t know how bad this is for you. I mean, our stomachs are pretty dang acidic so it’s not like we can’t consume acidic food. There’s probably damage done to our teeth enamel, though it may be minimal. No clue! You are correct- carbonic acid does serious damage quickly to tooth enamel. My dentist is quick to point out that still water is much healthier than sparkling water for this reason. I love sparkling water though! Thanks! Also, I’d love to read a weekly recap of what exercises you do. As a busy mom I love the format of reading one post & getting a condensed view of all the food you’ve eaten. Keep up the great work! We’ve had the same set-up for years (my husband also home-brews and force-carbonates, so it was really easy to use an empty keg for sparkling water), as do a number of friends who also home-brew, and I’ve never heard of sitting there and shaking a keg for 5 minutes! Nor does anyone I know use ice water. I can’t imagine that it would effect the taste, or the carbonation of the water. What differences do you notice from those steps? Also, don’t you guys get tired of the same flavor of carbonated water for so long? It takes us quite a while to go through 5 gallons, so we just carbonate the water then add juice or syrups or other things to our individual glasses. And we had a SodaStream for a long time before my husband went to force-carbonation, and loved it. I would recommend a SodaStream unless you already have an extensive home-brew set-up (including force-carbonation) with a dedicated beer fridge. 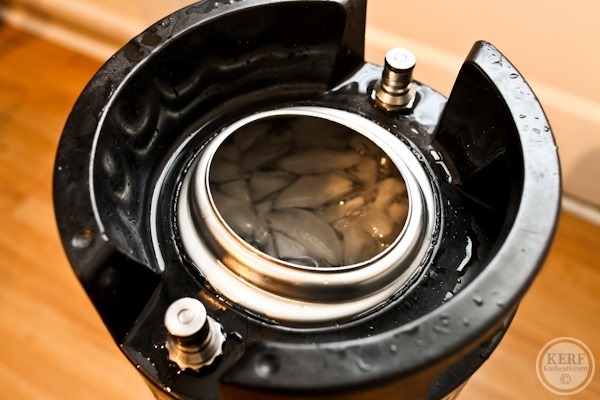 I’m too impatient to hook up the keg and wait a week – I want water (and beer!) now! If you use the shake method with beer you have to be careful not to overcarbonate – that’s really annoying and somewhat difficult to fix. I’m confused? We don’t have to wait a week… I’d have to ask my husband for the details (since he’s the brewer and not me!) but when he re-fills the keg with water he just rocks it back and forth a bit while he’s carbonating, and it’s ready right away. And I’ve never heard of pre-chilling the water with ice, ours has always tasted fine. And wow you guys drink a lot of carbonated water! We each have a glass or two a day, maybe, and it lasts us almost a month. I’m also not a fan of sweet things and prefer my water plain more often than not. It’s cool to see other people’s home brew set-ups! this is pretty cool. i’ve actually just discovered sparkling water & have been buying it recently. the carbonation seems to help me get my huge vitamins down more easily in the morning. it’s also just a bit more fun to drink than plain water! This is awesome! I LOVE carbonation. How is this better than a sodastream? They are a lot less than buying a brewers keg system just for carbinated water. It’s not supposed to be. People have just asked us about our kegs of sparkling water over the years and this is our post on how we do it. A good used soda keg will cost you about $45.00. The rest of the parts will run you less than $100 unless you go with a beer tower like these folks did, then you can plan for about $200. The real pay-back comes from consumables over time. A 5# tank of CO2 costs about $15 to exchange at your local welding shop or gas distributor. SodaStream’s 60 Liter CO2 exchange runs about the same and but their 60 Liter cartridge only contains 14.5 oz of CO2 – that’s less than one pound of CO2 for the same price! It won’t take long for the cost savings in CO2 alone to more than cover your original investment, plus you are now making carbonated water in quantity & not just 2 liters at a time. Hi Tom, I got most of my kegerator parts from you! Thanks! Looks delicious! That’s neat you can make it! I bet this tastes amazing, and it must beat anything store-bought. What other flavors would you recommend trying? We’ve done it with fresh oj and lemon too. And plain! I love sparkling water, and if I didn’t already have a Soda Stream I’d probably consider this method for meeting all of my sparkling water needs. 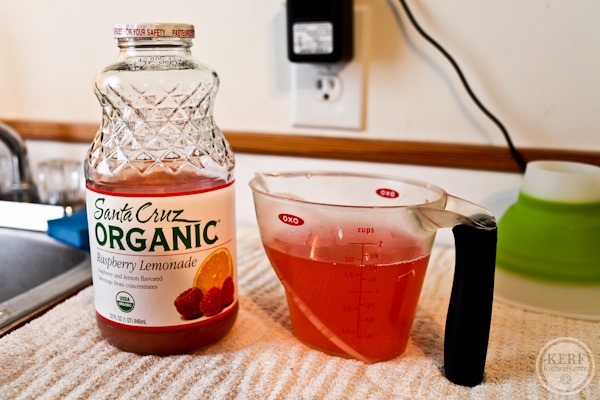 With your love of Kombucha have you ever considered brewing your own? I have been making my own for about 2 months and it is very easy! With a beer brewer in the house, I bet he would be equally as fascinated with the SCOBY and flavoring options! 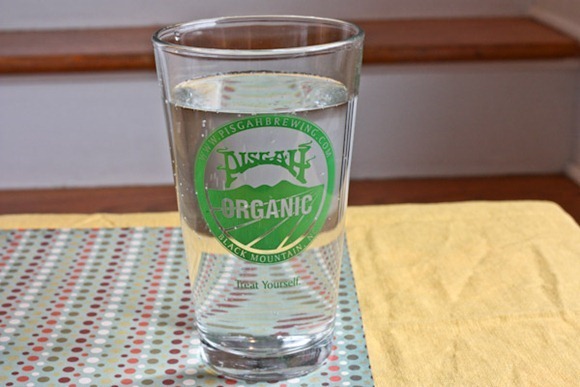 Water kefir is pretty harmless and easy to contain! I do not like fizzy water at all but the flavored stuff sounds great! 1. 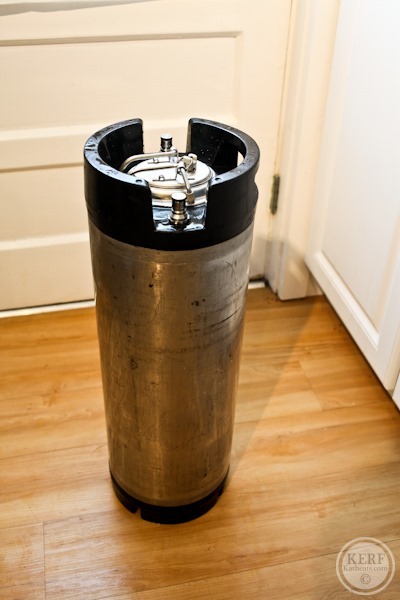 Carbonate your first keg exactly as outlined in this article and put it in the kegerator. This gets you carbonated water NOW. 2. 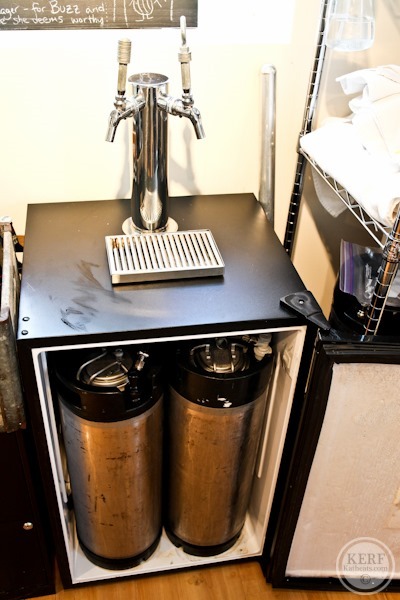 Go ahead and fill the second keg with cold tap water, close the keg, put it in the kegerator and hook up the CO2 line. 3. As you are drawing carbonated water from the first keg the second keg will carbonate itself & will be ready within 2 weeks. 4. Unless you drink massive amounts of carbonated water, the second keg will be ready when your first keg is empty. 5. 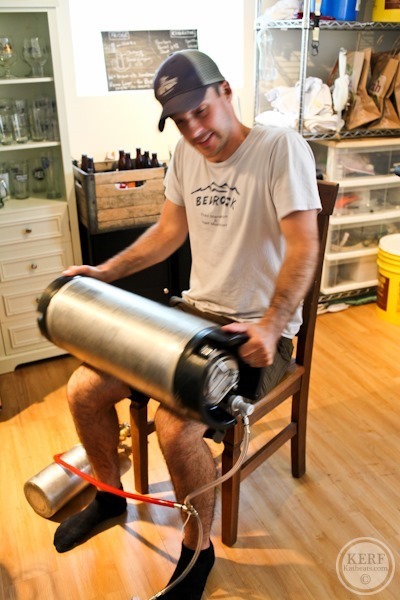 Repeat the process by filling the first keg & placing it back in the kegerator, & hooking up the CO2 line. Great advice, if there weren’t already a (shaken force-carbonated) beer on tap right next to it! But yeah, I also have a three way manifold in my other fridge for other kegs and frequently have many things on the way to carbonation. It’s rare, though, that I take the time to wait for something to carbonate. I’ll at least get it close by shaking and I’ve gotten pretty good about not over-doing it. Wish I had the equipment to do this at home! I do have a question though: how do you get vines to show up in your posts? I also go the DIY route, and was working on a very similar post. We’ve been carbonating water for almost a year now. Since I make batches of 2 liters at a time, it’s a bit easier than dragging a keg around. Either way, it’s far, far, far cheaper than a Soda Stream. Great guest post, Matt! I used to have a retro soda maker that used CO2 cartridges and loved creating freshly made soda when I needed it, but it never lasted very long. This would be a great alternative if you’ll willing to make the investment for home brewing. Thanks for sharing! Hi, I was wondering if you disconnect the co2 after shaking it and can i store the keg at room temp? I don’t have that much ref space to keep a keg and was wondering if this will affect the soda water? Thanks for post. This is great and all, but it’s nothing like Clearly Canadian – do you remember the effervescent goodness from a long time ago? Clearly Canadian is re-launching the original formulas in glass bottles via a fan-led campaign to bring back into production. Let’s support the campaign and make matters that much easier! I have missed Clearly Canadian for years!! This is exciting. I just have to say THANK YOU. My beau is a Homebrewer and today showed me how he could get a cap for a 2L bottle that would allow him to make me bottles of carbonated water, so I asked about doing a whole keg- he thought there might be some problems with the process, so I googled it and your website came up- 1 hour later I was drinking fresh homemade, ice-cold sparkling water with NO cost extra to us and MUCH less waste. I’ll be doing this tonight. I already have the setup for beer so it’ll be a piece of cake to do. I’m going to try mango lemonade! I might get the Perlick Flow Control faucet so we can fill some flip top bottles to bring to work. I heard with that faucet you can dial it down to a trickle and keep it carbonated. This looks great. But I’ll be buying food grade CO2, no chance I’m buying CO2 from the welding shop or the sports store! This is a great idea. I’ve been using “corny” kegs for years for my lemonades. I make “candy syrup” in the kegs and pressure it with N2 through a flash chiller for the most awesome lemonade. I use a handbuilt press to squeeze each quart individually. Something in your video doesn’t make sense though. I see a line running from the regulator to the corny keg carrying the co2. But, there’s a “T” in that clear line. One end goes to the keg, the other disappears out of view without explanation. Can you explain that?